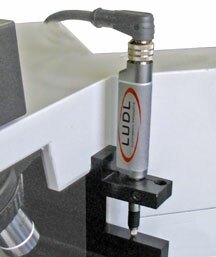 Smart Focus Encoder | Ludl Electronic Products, Ltd. Most conventional encoders are designed to detect a change in position. As the position changes it signals the controlling system with a series of pulses. The number and frequency of the pulses allow the controller to determine the position. However, since all of the pulses are identical its impossible for the controller to determine the position without an initial reference. The Smart Focus Encoder achieves a new level of focus performance utilizing a high speed, proprietary digital interface to report the current focus position in absolute terms. This completely eliminates the need to initialize or reference the encoder – it will always report the correct position. Cycle power, re-boot software, change specimens, switch objectives; the encoder will always report the correct position within fractions of a micron!